Ever since early 70s, Ma.Sol. s.r.l. began to work in the field of the medium-heavy carpentry, machine tools and steel special structures. In the last 20 years gained the confidence of the building companies: Ma.Sol. self erecting tower cranes with low rotation fully met the specific worksite needs. Ma.Sol. s.r.l. works in a 11.000 sqm area, 3.000 sqm of which are covered. Components' design and production are entirely realized at Ma.Sol. 's works, utilizing certified materials and advanced technologies. Proximity between technical office and production allow to minimize losses of time and to keep a strict product standard control, contributing to the reduction costs. 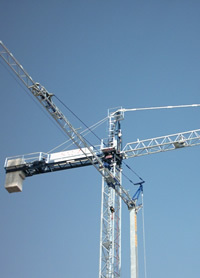 The close connection created over the years with the suppliers allows a continuous renovation of the technologies fitted onto the product, crane safety and manoeuvrability. Ma.Sol. cranes have jib from 20 m to 36 m, jib-point load capacity from 600 kg to 1.000 kg and max load capacity up to 4.000 kg. Tower and jib structures are entirely hot-galvanized, to ensure a lasting protection of the components. If required, the crane can be supplied with galvanized base.